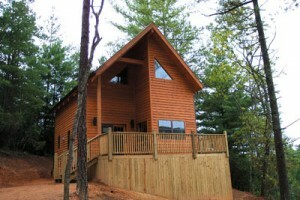 Linville NC cabin rentals are a great way to spend a vacation. There’s something for everyone on the Blue Ridge Mountains, from hiking and kayaking to simply breathing in the clean mountain air. At Blue Ridge Parkway Cabin Rentals, our properties are conveniently located near miles of hiking trails and several waterfalls. But you’re still just a short drive from the restaurants, shops and entertainment in nearby Linville, Boone and Banner Elk. For a secluded getaway just minutes from civilization, book your stay with us at Blue Ridge Parkway Cabin Rentals! The Blue Ridge Mountains have been the subject of many a song, painting and photograph. The rich dark green pines against a colorful sunset make for a striking sight. Every season that passes in the Blue Ridge comes with its own pleasing palate. The autumn is full of vibrant oranges and reds, winter is a blanket of white and blues, and spring and summer breathe the green back into the ancient mountainside. All the while, our lovely Linville NC cabin rentals provide guests with a front row seat to the spectacular scenery. If you’re in the market for a High Country vacation rental, there’s no better place to stay than with us. Our two identical cabins are carefully constructed and are located just steps off the famous Blue Ridge Parkway. But these aren’t your great grandmother’s cabins. Both possess cathedral ceilings and skylights that open the space to create a relaxing ambiance. Knotty pine planks cover the walls, and rough-hewn furniture compliments the rustic decor. They’re some of the most beautifully built cabins on the parkway. In addition to having everything you’ll need for a lovely vacation in the Blue Ridge, our cabins also feature a number of luxury amenities, including Wi-Fi, satellite TV, and a private hot tub. 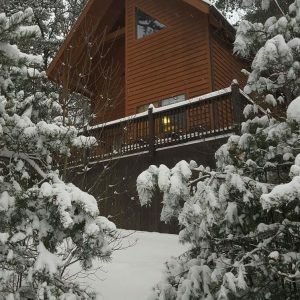 Skip the traditional Linville NC cabin rentals and stay at the nearby Blue Ridge Parkway Cabin Rentals today. You can reach us by phone at (919) 602-6722, or contact us online to book your rentals. If you’re not quite ready to commit to a stay, maybe our specials page will sweeten the deal. You’ll be glad you chose to rent with us, and you might discover your new favorite place in the Carolinas!